There aren't a lot of theoretical physicists who have helped solve an old puzzle in biology. But then, not a lot of theoretical physicists are Geoffrey West. As president of the Santa Fe Institute (SFI), West brings one of the research community's most versatile minds to bear on some of nature's most complex questions. Science has never been a world of discrete disciplines. Rather, physics, geology, economics, psychology, even the arts all overlap in a kind of meta-system, with the principles of one touching those of the others. Investor behavior can mimic that of schools of fish; genealogical trees for languages can resemble those for species; mathematics can drive music. In 1984, I was co-founder of SFI, a nonprofit research facility for theoretical work on just those kinds of phenomena. Geoffrey West's current research is among our most fascinating. Working with ecologist Jim Brown of the University of New Mexico, he has studied, for example, the relationship between the average weight of a species of mammal and such variables as blood pressure or metabolic rate. Such formulas are remarkably precise, holding true from shrews to whales. West and Brown are trying to see if similar relationships apply for social organizations such as cities and companies. Think those things don't affect you directly? Think again. Studies of social animals, for instance, can teach us a lot about how armies and terrorist groups work, allowing us to respond better to security threats. Knowing how our brains learn can help us design better computers. Understanding the behavior of schools of fish can help us avoid disasters like the 1987 stock-market crash. 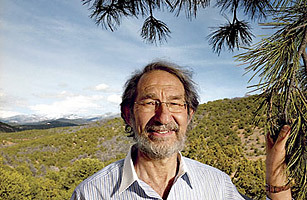 West, 65, a former theoretical physicist on the faculty at Stanford University and later head of the particle-theory group at Los Alamos National Laboratory, became SFI's president in 2005. His gifts are precisely what's needed to encourage scientific disciplines to mingle so freely.